By now many of your have read about 46m’s big adventure into downtown Mountain View. Here we take a closer look at how he got there based on data we retrieved from his collar after we anesthetized him in a parking lot in Mountain View. 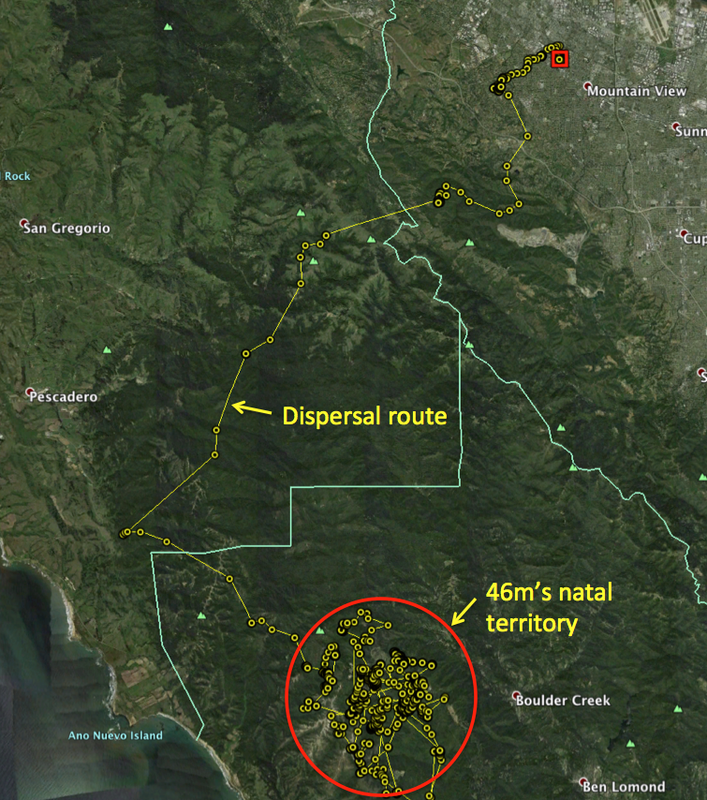 We originally collared 46m in January just south of Big Basin State Park. You can see from the image below that for the first few months that we had a tag on him, he stayed in his mother’s territory. Then, like all young males, he dispersed from his mom’s territory to seek out one of his own. In other studies, young males have been known to travel up to hundreds of miles before settling down in a place to call home. Part of our research is trying to understand what kind of obstacles and barriers these animals face as they disperse. 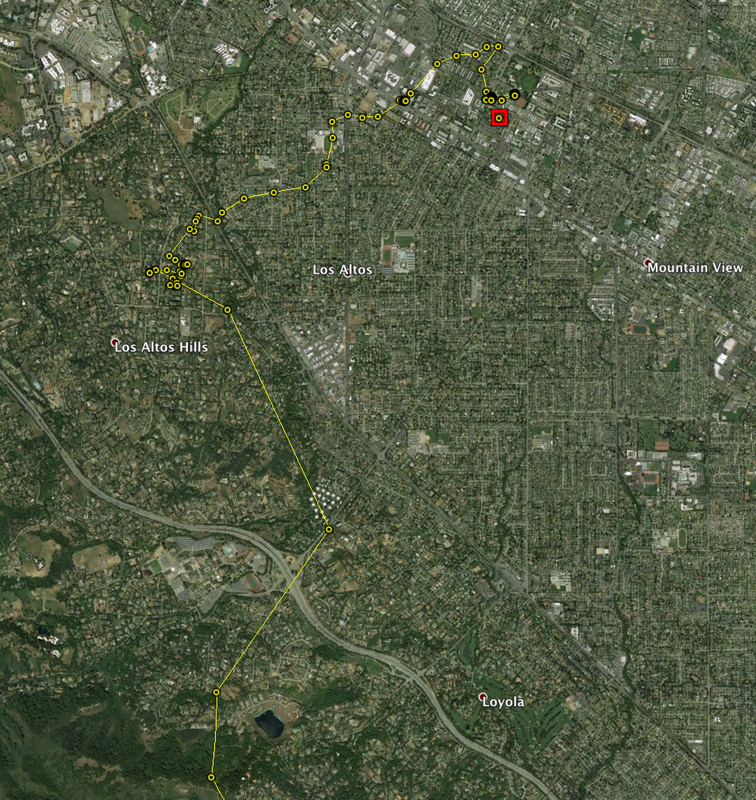 In this case 46m wandered north for roughly 2 weeks across the Santa Cruz Mountains into downtown Mountain View. Note that each yellow point here represents one of 46m’s locations derived from a GPS unit on his collar. Points are anywhere from 5 minutes to 4 hours apart in time. We connect the points with a yellow line, but that doesn’t necessarily mean he traveled along that line between points. If we zoom in on the northern part of his track, we can see where he left the wild and entered a sea of urban development below. He crossed highway 280 and enterd the Los Altos hills, where he wanderd around and then hunkered down for the day. The next night he started moving around again and found his way into downtown Mountain View nearly 4 miles from the wildlands he came from. That’s two nights and parts of three days so far that he was wandering around this highly developed area, and no one had seen him yet. He’s looking for a territory with potential mates, but clearly this was not it. My best guess at this point, is that he was looking for a way out, but he was so deep into the urban area, that he was not sure where to go to get back to open space. In the meantime he evaded detection by moving at night, and hiding in whatever places he can find — in a bush, under a parked car, up in a tree etc. Finally at dawn after his second night, he settled down around 5:45 am and spent the next 9 hours hiding behind a bush in front of an apartment complex on a busy street. 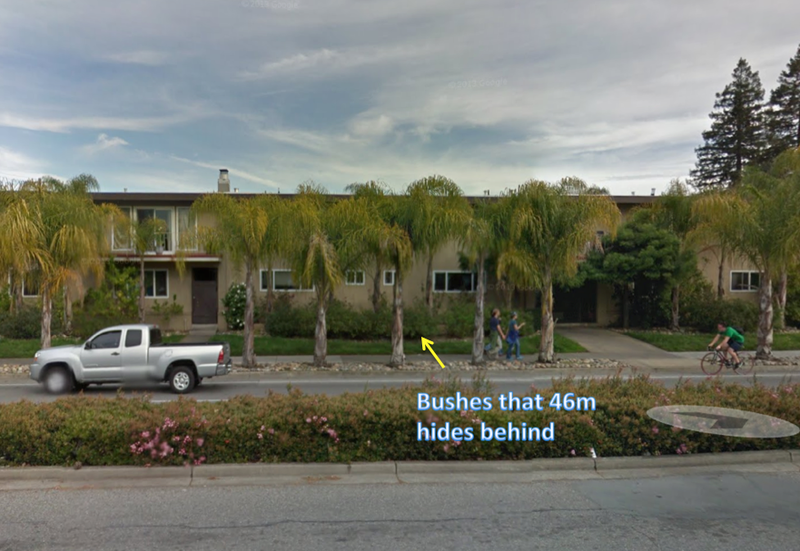 Here is what that bush looks like. Amazingly, despite being walked and driven past by hundreds of people, nobody saw him. Nobody noticed him, and perhaps people will find it reassuring that he didn’t bother anyone either. At around 3pm he decided he didn’t like that spot any more, and he decided to try and find a better place to hang out, as you can see his movement path in the figure above. Around 7pm we got our first calls from the Mountain View police about a possible collared puma wandering around their town, and we read on the Twitter feeds about a helicopter circling overhead to try to locate him. 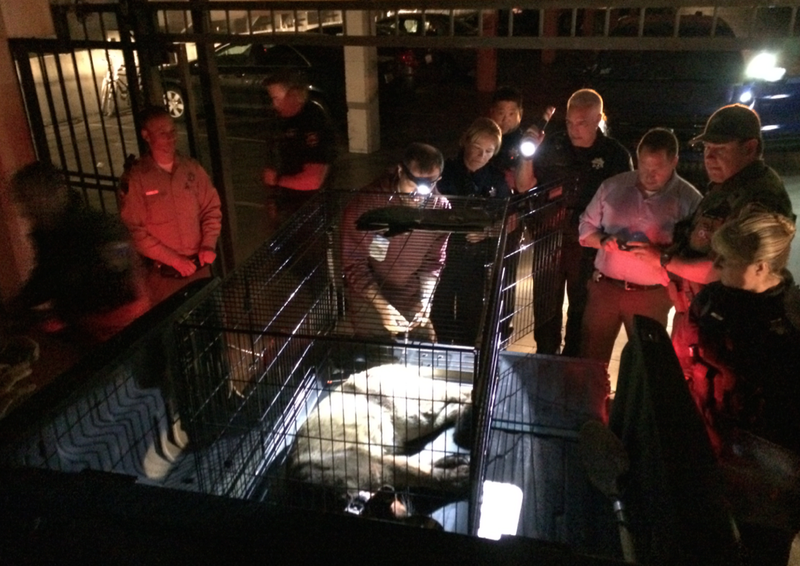 Fortunately, the police surrounded him in a safe spot in a parking garage, and we were able to safely assist Cal Fish and Wildlife with anesthetizing him and getting him back to open space! We’ll keep you up to date on 46m’s future movements and let you know how he is doing.